About a week ago, we issued some statements challenging Al Gore to do civil disobedience on a RAN day of action coming up. I hope to write an analysis soon about the logic behind doing it and the way it has helped frame issues in the media, but in lieu of talking about media strategy and Story, I wanted to quickly share one of the articles that resulted from it. This is from The Nation. Fresh from winning the Nobel Peace Prize for his climate change evangelism, Al Gore is apparently considering an invitation from a prominent environmental group to engage in civil disobedience against the construction of new coal-fired power plants. Rainforest Action Network issued the invitation to the former Vice President, according to RAN executive director Michael Brune. The San Francisco-based group has a twenty-year history of protesting against destructive logging practices and other causes of climate change; it specializes in targeting corporations as much as governments. The first Bay Area screening of Young, Jewish, and Left is coming up! If you wanna organize a screening check out their website. You can also check out the review Dan Berger wrote of the film for Left Turn. Left Turn | The truism that Jews historically have been disproportionately represented in the Left is more the material of Woody Allen films than a topic of conversation in the movement. At the same time, the actions of the Israeli state and settlers, the debates of what constitutes anti-Semitism and the visible presence of some reactionary Jews in the US political mainstream often obscure the rich history of Jewish radicals and radicalism. Difficulties have been replicated within many Jewish communities where disputes rage over Zionism, religion, and gender. Many activist Jews face a dichotomy: either one is Jewish or a radical, each with its own set of implicit assumptions. But what of the majority of Jewish radicals, who strive to combine both their Jewish heritage and their radical commitments without apology or explanation? Today, the Nobel Committee awarded the Peace Prize to Al Gore (and the Intergovernmental Panel on Climate Change – The IPCC). We’re very happy for him at RAN. And we think he belongs in jail. Specifically, he should go to jail on RAN’s November 16-17 Day of Action Against Coal Finance. So we’re calling him out and asking him to put his peace prize where his mouth is. We’re telling Al Gore that we want him to get arrested, Nobel prize around his neck, for blocking the construction of coal-fired power plants. But we’re telling him to do it strategically. By the time the bulldozers are on the ground, it is already too late. We need to stop these projects before they start and the best way to do that is by preventing them from being financed in the first place. The coal industry depends on Wall Street. So we’re going after the industry’s biggest funders: Citi and Bank of America. Rainforest Action Network, Coal River Mountain Watch, Appalachian Voices and thousands of supporters are mobilizing to stop Bank of America and Citi from financing coal extraction and the construction of those coal-fired power plants. Coal is Over. Fund the Future. If you, too, think Al should be arrested, go ahead and sign our petition asking him to be arrested with us. If Al is going in the slammer, we’re going with him. Will you join us? PS – you don’t actually have to be arrested to be a part of the Day of Action – everything counts – from teach-ins to flyering to photo-ops and more! PPS – After Thomas Friedman just wrote an arrogant column in the New York Times claiming that there is no Youth Activism anymore (whaaa?) he is invited to get arrested with us too…or he can keep writing articles about why young people don’t do activism anymore, instead of actively participating in and supporting young people doing activism. The other day some sneaky unnamed RAN activists did an action that you can execute inside almost any building. All you need is some baloons, a banner, and a dirty, dirty corporation. If there is a corporate office with a really high ceiling, its even better. For more info on our No New Coal campaign, check out Free Speech Radio News, who is doing a 2 part series on Citibank and Bank of America’s investments in coal. 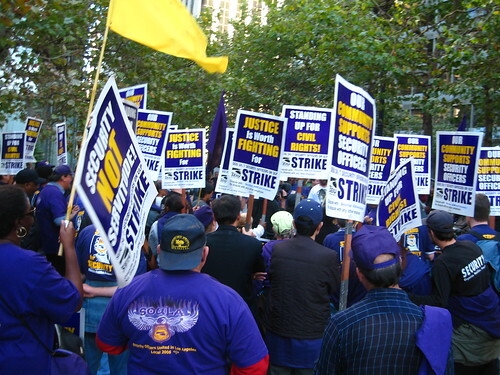 Last week Security Workers in San Francisco went on strike. 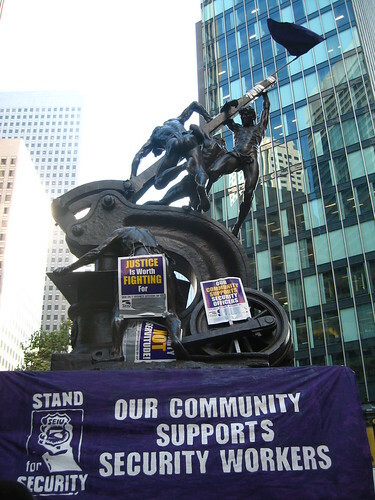 Members of SEIU Local 24/7 (awesome name for a Local) have been fighting for a decent wage and healthcare, against a system that treats them without dignity or respect. 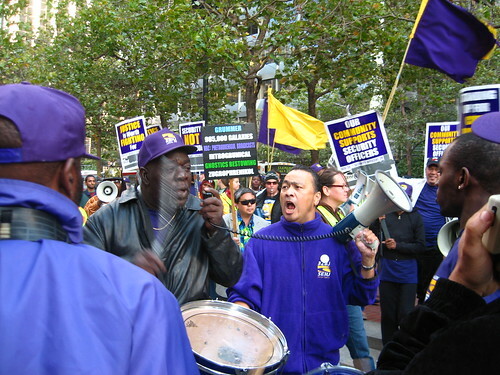 Security Workers in the Bay make $5 an hour less than janitors. The strike has been dynamic and inspiring. The union has embraced a range of tactics, like flying squads, rotating pickets, marches, rallies, demonstrations, actions, fliers, postering etc, all coordinated to keep up energy and build momentum. It has completely shaken up all of downtown San Francisco, and won public sympathy in the process. I’ve been doing a bit of support work throughout the week last week and have been absolutely inspired by the determination and energy of SF security workers. The picketing and marching was fun, but didn’t compare to just getting to hang out with workers and hear their stories and hear folks talk about how they have never been involved in anything like this before, but that they are fighting for their kids and their families and they aren’t going to back down, even in the face of giant companies like Securitas, ABM, and Universal Protection Services. They’re fighting back against intimidation, harassment, racism and cycles of dead-end poverty-waged jobs that have high turnover rates, and ironically, very little security.